A clever play on words, Bottles Up is a cute, little plastic bottle boat crafted by the owner and employees of the Rain Tree Lodge – an eco backpacker’s hotel on the island of Viti Levu in Fiji. 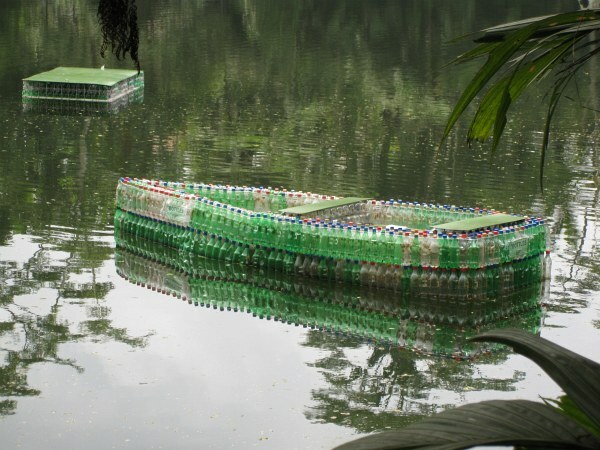 The boat is built out of plastic bottles (including Fiji water bottles!) and a layer of foam, held together with glue. It may look dainty, but surprisingly the boat can remain afloat supporting three large Fijian men as they paddle around in it. The owner of the Rain Tree Lodge claims that this is be Fiji’s first plastic bottle boat and he hopes this boat will inspire other Fijians to reuse materials in their personal lives. The Rain Tree Lodge is located directly adjacent to the Colo-i-Suva national rainforest and park outside of Fiji’s capital, Suva. Tom, the owner of the lodge, built the boat earlier this year with the help of his employees. Thinking that David de Rothschild and the Plastiki would be making a stop through Suva, the team had the boat all ready to welcome the world-famous plastic bottle boat. Unfortunately, the Plastiki didn’t stop in Suva, but they still make use of the boat on the resorts lake next to the restaurant. The boat is composed of modular sections of plastic bottles glued together with a layer of foam underneath to further aid in flotation, and some plastic sheeting for the seats and floor deck. The boat building crew is also experimenting with a sandwich-style floating platform that could be used by farmers in Fiji to float their crops down river to the market. The Rain Tree Lodge’s owner hopes that his experiments and designs can be used by Fijians to make use of the many plastic bottles being discarded in the country. This is so fabulous, my friend and I are collecting bottles for this very purpose, to paddle around the Hamilton Lake (New Zealand). I'm really enjoying looking at all the different designs on the internet; I'll probably use some type of epoxy to glue my bottles together, I've also seen bottles held together with fishnets; made into pontoons as a base ... but I like the tidy look of this one. Yes I think this is my favourite ! Fantastic!!! but what is the base underneath made of and how is it connected to the bottles? I want to make it! I salute to the ingenuity of the inventors! God bless you more and more! how smart! you can open all the lids and collect rainwater too! A clever play on words, Bottles Up is a cute, little plastic bottle boat crafted by the owner and employees of the Rain Tree Lodge - an eco backpacker's hotel on the island of Viti Levu in Fiji. 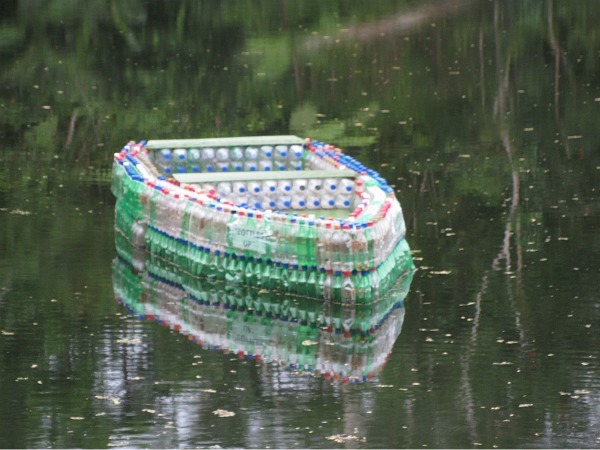 The boat is built out of plastic bottles (including Fiji water bottles!) and a layer of foam, held together with glue. It may look dainty, but surprisingly the boat can remain afloat supporting three large Fijian men as they paddle around in it. The owner of the Rain Tree Lodge claims that this is be Fiji's first plastic bottle boat and he hopes this boat will inspire other Fijians to reuse materials in their personal lives.